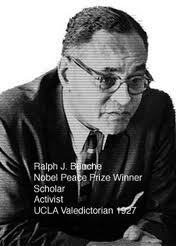 Ralph J. Bunche (1903-1971) was the first African American and the first person of color to win the Nobel Peace Prize, an honor he received in 1950 in recognition of his successful mediation of the Armistice Agreements between Arab nations and Israel. It was the first and only time in the long history of the Middle East conflict that peace agreements were signed by all of the nations involved. For almost two decades, as Undersecretary General of the United Nations, Bunche was celebrated worldwide for his contributions to humanity, particularly in the areas of peacekeeping, decolonization, human rights and civil rights. A little known fact is that Bunche was the chief drafter of the sections of the U.N. Charter that deal with trusteeship and decolonization at the San Francisco Conference of 1945. 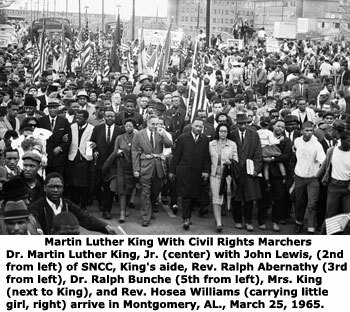 Some popular accounts of the 1965 Selma March also overlook the fact that an ailing Bunche joined arms with Martin Luther King to lead the procession. 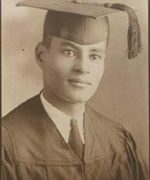 Bunche was valedictorian of UCLA’s Class of 1927, received his master’s degree in Political Science from Harvard in 1928, and for the next six years alternated between teaching at Howard University and working toward the doctorate at Harvard. He completed his dissertation in 1934 and did postdoctoral research in anthropology at Northwestern University, the London School of Economics, and Capetown University in South Africa. Throughout his career, Bunche maintained strong ties to education and scholarly research. He chaired the Department of Political Science at Howard University from 1928 until 1950, a period in which his analysis of racial politics in American South made major contributions to one of the most significant 20th century books on race, An American Dilemma. He taught at Harvard University from 1950 to 1952; served as a member of the New York City Board of Education (1958-1964), as a member of the Board of Overseers of Harvard University (1960-1964), as a member of the Board of the Institute of International Education, and as a trustee of Oberlin College, Lincoln University, and New Lincoln School. 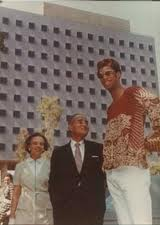 UCLA’s Center for African American Studies was renamed after Bunche in 2003, in commemoration of the centary of his birth. To learn more about the life and accomplishments of Ralph J. Bunche, please go to UCLA Library’s Ralph J. Bunche Virtual Exhibit.